We are a leading Manufacturer & Supplier of Carton Taping Machine. These products are made of our skillful experts using advanced technological advancements. These are made of high-grade raw-materials and provides optimal functionality and long service life. In addition, these are easy to operate and are provided at reasonable market rates. These can also be availed with customization facility. Our products are widely acknowledged for its robust construction, extraordinary performance, increased production rate, energy efficiency and high durability. We are one of the leading organizations in providing the a commendable range of Random Size Carton Taping Machine to our precious clients. These products are fabricated using premium quality raw material and advanced technology maintaining the international standards. Our range of products is ideally used for strapping cartons of various heights without any tools and equipment and can also be obtained by our clients with customization facility as per the clients needs. Cartons / Hour 700-1200 Nos. 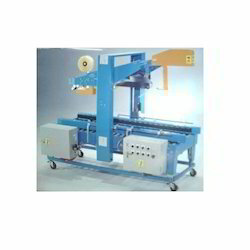 We are one of the established firms in providing a wide assortment of Flaps Folding Taping Machines to our clients. All our products are made with the premium quality raw-materials procured from the trusted vendors as per the international quality standards and advanced technology. In addition, our products are strictly tested under various parameters so as to ensure their quality and flawlessness and can also be availed in customized specifications, as per the needs of our customers. Adjustable side overlap up to 75 mm. 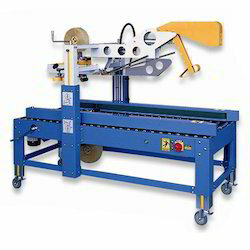 We are one of the reputed organizations involved in offering a broad array of Random Flap Folding Taping Machines to our esteem clients which are manufactured using premium quality raw materials and advanced technology. These are made in compliance with the international quality standards. In addition, our products are quality tested on various parameters so as to ensure their quality and flawlessness without any compromises which can also be availed in customized specifications as per the needs of our clients. Adjustable side overlaps up to 75 mm. Due to the vast industrial experience, we have been able to manufacture an excellent assortment of Top Bottom Adjustable Carton Taping Machine for our esteem clients. These are specifically designed to seal all types of cartons from both the sides and are strictly made in compliance of international quality norms standards. Our products can also be availed in customized specifications as per the clients needs and requirements. • Suitable for sealing all height cartons on both sides. • The side overlap adjustable upto even 75 mm. • Height adjustments from either Side-Pillars. • Wider size driving belts for better stability much longer working life.. 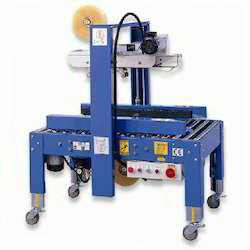 Looking for Carton Taping Machine ?